A while ago, I wrote about how rare it is for car manufacturers to aim their advertising at women, and how there seems to be little effort to get those of us who identify as female interested in all things automotive. Then came the Great Sindy Jeep Argument, and I realised that there was one area I’d overlooked. I was mooching around on Facebook a while ago and I noticed my sister had made a comment about how much she loved her Sindy Jeep when she was a kid. This immediately set my hackles rising, because I knew exactly what car she was talking about… and it was a dark red Range Rover. 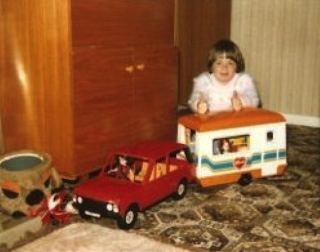 What else was a smart British doll-about-toytown going to use as a tow car for her caravan and her horse box? I’d previously been reminded of it whilst watching the Top Gear Bolivia Special, because I was highly amused that Jeremy Clarkson seemed to be driving Sindy’s old car. But that’s kind of the point – it was a Range Rover. It wasn’t something that was meant to look a bit like a Range Rover, or that it was some kind of generic off-roader (they did that with the Sindy Beach Buggy, which didn’t look like anything in particular, but was properly thought out, with high ground clearance, and big, knobbly tyres for bouncing over dunes, albeit in 1:6 scale); it was unmistakably a Range Rover, complete with the black pillars and distinctive light clusters. I wonder how many women of a certain age have Rangies today because the idea was planted when they were towing Sindy’s horse to an imaginary gymkhana? And even before my sister was a twinkle in a toyshop owner’s eye, Sindy had an MGB, and later the ‘Fun Buggy’, which did bear a certain resemblance to a Willys Jeep if you squinted and looked at it a bit sideways. You won’t find Sindy in the shops these days, but her American rival, Barbie, is still going strong – and Barbie did indeed have a variety of Jeeps, not to mention a ’57 Chevy Bel Air, a Thunderbird, and numerous Mustangs and Corvettes. What’s more, Barbie’s Jeep was available as a battery powered ride-on toy. Often though, Barbie’s tastes are surprisingly European. 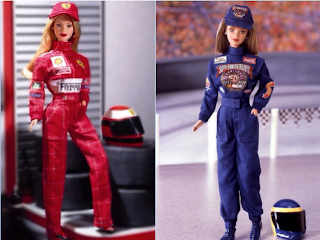 In the 80s, Sindy might have had a Range Rover, but Barbie had her first Ferrari – and in classic Rosso Corsa rather than candy pink – and Porsches including a 911 Cabriolet and a Boxster followed in due course. Her very first sports car, back in 1962, was an Austin Healey 3000, closely followed by a convertible Mercedes, and later, Barbie had a Jaguar XJS. There was even a 1:6 scale Ferrari F1 car, with Barbie herself behind the wheel, but that was a one-off collector’s piece rather than a toy for general release, created for the Barbie Collectors’ Convention of 2004 (although she has had her own race car, and there have been both Scuderia Ferrari and Nascar motorsport Barbie dolls). In more recent years, her tastes have become no less chic, but perhaps a bit more down to earth – her garage has become home to a Volvo V70, a Fiat 500 and a Volkswagen New Beetle, and her fans can drive around on a battery-powered, Barbie-themed toy Smart. Even Ken gets in on the act – he has a MINI Cooper. But Barbara Millicent Roberts hasn’t entirely lost the need for speed. Her garage also includes a Nissan inspired by the 350Z with a tasteful chrome and gold wrap. And now, whilst it’s a generic, Barbie-branded design, there’s still a sleek sports car in the range. So perhaps car manufacturers are part way there after all. Now they just need to learn to market to those same little girls who love Barbie and Sindy’s cars when they grow up and can drive the real thing for themselves.